Business process management (BPM) focuses on improving corporate performance by managing and optimizing a company's business processes to achieve business goals. 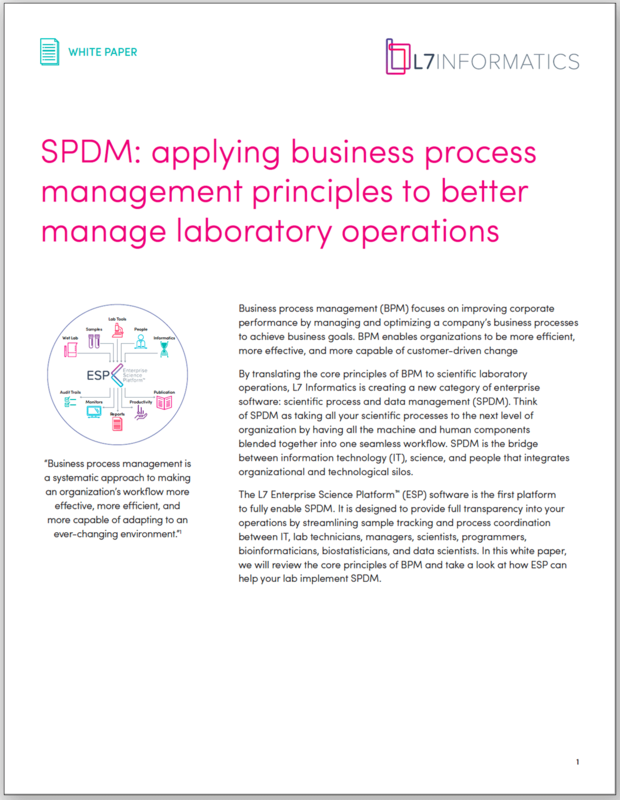 By translating the core principles of BPM to scientific laboratory operations, L7 Systems is creating a new category of enterprise software: Scientific Process & Data Management (SPDM). L7 Enterprise Science Platform (ESP) software is the first platform to fully enable SPDM. L7 ESP is designed to provide full transparency into your operations by streamlining sample tracking and process coordination between IT, lab technicians, managers, scientists, programmers, bioinformaticians, biostatisticians, and data scientists. Ready to meet your SPDM goals? Complete the form to the right to download our white paper!